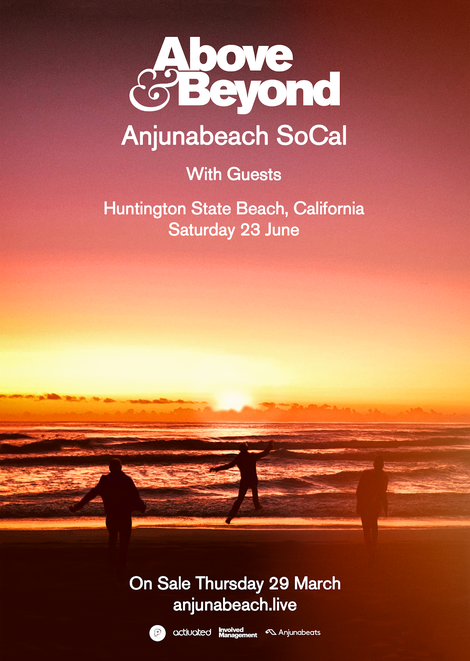 Named after the beach in Goa that inspired their Anjunabeats record label, Above & Beyond host a one-day festival event on the sand at Huntington State Beach, CA on 23 June. Heading into the final days of a 30-date tour celebrating the release of their new album ‘Common Ground’, North American clubbers can look forward to the GRAMMY Nominated trio taking to the sand this summer. The real 'Anjuna Beach' resides in Goa, India. Its history as a global party destination has inspired many, including Jono Grant, Tony McGuinness and Paavo Siljamäki (aka Above & Beyond), who named their Anjunabeats record label after it. The London-based band will welcome a host of talent from their Anjuna family of artists to the bill and will also be performing an exclusive second set of their own. ‘Common Ground’, the fourth studio album from the trio, was released 26 January on the band’s own Anjunabeats imprint and debuted at #3 on the Billboard 200 Albums Chart. The album includes the tracks 'My Own Hymn', 'Northern Soul', 'Alright Now' and 'Tightrope' and new songs with longtime collaborators Justine Suissa (‘Naked’ and ‘Cold Feet’), Zoë Johnston (‘Sahara Love’ and ‘Always’) and Richard Bedford (‘Happiness Amplified’ and ‘Bittersweet & Blue’). Tickets go on sale from 29 March.